Last October, food writer Michael Pollan actively promoted a European advocacy group making the dubious case that genetically modified foods are dangerous to eat. Scientists and science journalists just shook their heads in bewilderment. Pollan had just tweeted a news release issued by the European Network of Scientists for Social and Environmental Responsibility, better known by its acronym. ENSSER certainly has an impressive sounding title, but that disguises a questionable agenda, say scientists—one that Pollan and other journalists are certainly acquainted with. For those not in the know, ENSSER is an organization with an ideology. 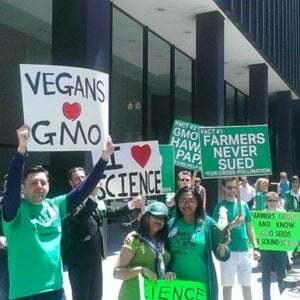 It has a mission statement that purports to promote “critical thinking fora (sic) scientists” and a commitment to rectify the “negative impacts of new technologies and their products.” On biotechnology, its members believe—this is faith and not science—that the debate over GMOs is over, that they are harmful and should be banned or restricted out of existence. While ENSSER is widely quoted by activists, its profile among mainstream scientists and journalists—with a handful of exceptions—has been miniscule. 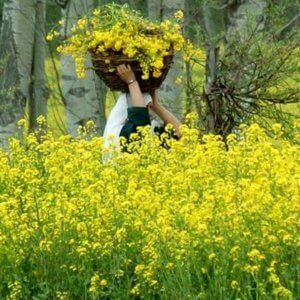 The last year has seen a sea change in the views of the chattering classes about GMOs. While the debate over labeling rages in various states and in the cyberspace driven media, concerns about whether GMO foods might pose health hazards has receded among the intelligentsia. Two years ago, for example, anti-GMO campaigners, led by ENSSER, hyped the now infamous rat cancer study study by French scientist Gilles-Erich Séralini that purported to link GMO corn to cancer. While the best journalists immediately reported on the flaws in the study, activist writers were quick to play the fear card. 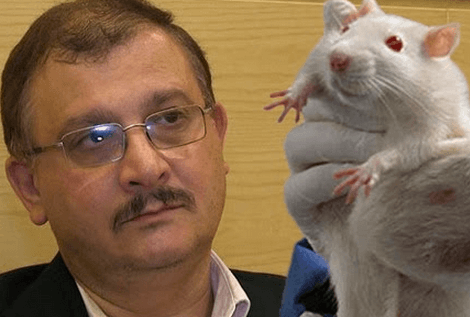 The controversial Séralini study sparked an immediate furor among independent scientists, including those who support the labeling of GM foods but found his research sloppy and poorly documented. Scientists have often responded forcefully after the release of poorly constructed studies. What was unusual that time was that they were joined by disgusted science journalists, who traditionally have given activists, foodies and NGOs a free pass on this issue. The study was ultimately retracted last November because of its alleged scientific dubiousness and expunged from the science record. Over the past two years, a stream of articles have buttressed the growing sense that GM opponents have become, in the words of Discover blogger Keith Kloor writing in Slate, “the climate skeptics of the Left.” We’ve reached an intellectual tipping point on this controversy. Almost every prominent liberal journalism outlet, from the New York Times to Scientific American to The Atlantic, has prominently featured an article contrasting the growing disconnect between scientists who view GMOs as safe and popular fears hyped by some foodie heroes and organic activists. Which brings us back to ENSSER. It was established in 2009 before many “liberals” embraced opposition to GMOs as a litmus test issue. The organization has not aggressively encouraged science education. Rather it has focused on organizing media events and tours to promote controversial research by Séralini and other researchers who claim to have identified health dangers. It appears their goal is to bypass the science establishment and talk directly to legislators and consumers with an emotional relationship to food and an antipathy to technology. As scientists, physicians, academics, and experts from disciplines relevant to the scientific, legal, social and safety assessment aspects of genetically modified organisms (GMOs), we strongly reject claims by GM seed developers and some scientists, commentators, and journalists that there is a “scientific consensus” on GMO safety and that the debate on this topic is “over”. We feel compelled to issue this statement because the claimed consensus on GMO safety does not exist. The declaration became a sensation in anti-GMO conspiracy circles after heavy promotion by Pollan, the Organic Consumers Association, anti-GMO groups and anti-establishment junkies like Alex Jones. Of course for those familiar with the research on crop biotechnology, the consensus on the safety of GMOs is as strong or stronger than the rejection of Creationism. The ENSSER statement echoes the ongoing campaign to deny the fact of human-induced climate change. But even climate change deniers have done a better than assembling a few hundred motley supporters. 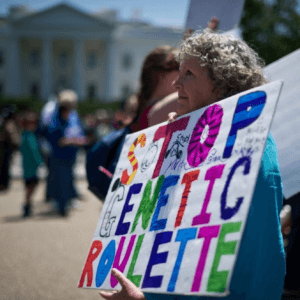 More than 31,000 scientists are said to have signed a petition claiming there is “no convincing scientific evidence” for global warming—attracting some of the same fringe conspiracy-promoting activists that campaign against GMOs. How do the views of mainstream scientists stack up against ENSSER’s claims? 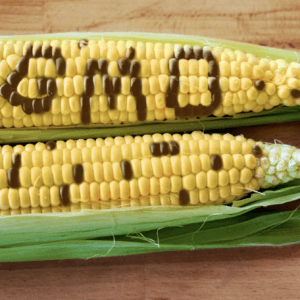 A 2013 paper by independent researchers in Italy noted there have been 1783 studies on safety and health issues related to GMOs over the last ten years alone, including many publicly funded, confirming the consensus in support of the safety of GMOs. To those familiar with the science of GMOs and the health and safety testing record, the ENSSER statement read like farce. Few of the ENSSER signees are considered prominent in crop biotechnology. The list includes sociologists, heads of NGOs, local physicians, lawyers, businessmen, philosophers and committed anti-GMO activist-scientists Doug Gurian-Sherman at the Union of Concerned Scientists and Michael Hansen with Consumers Report—a ‘Who’s Who’ of anti-biotechnology campaigners. Nicolas Defarge, co-author of Séralini’s now retracted paper, who along with Séralini was a signee of this statement, is ENSSER’s Deputy Chairman. While ENSSER is considered a fringe organization by most scientists, it does get traction among its target audience: scientifically ‘soft’ consumers, liberal activists and in universities. 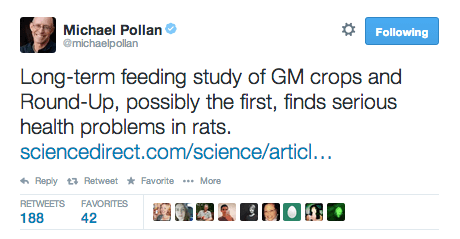 It can also rely on one reliable resource to spread anti-GMO views: Reuters. Carey Gillam, the news services’ crop biotechnology reporter, who is widely known for her anti-GMO bias, almost always references a ‘lack of consensus’ about GMO safety. Gillam could have quoted the views of the National Academy of Sciences or the World Health Organization or the European Commission, instead of a fringe collection of NGOs and activist scientists, but that would have put a far different slant on her “objective” coverage. That’s how organizations like ENSSER get their message out.